Is the Gospel for unbelievers only, or is it also for seasoned Christians? The thesis of the author, a Bob Jones and Master’s seminary grad, is that Christians ought to rehearse the Gospel every day. He bases this on Romans 1:15, where Paul writes to the Roman Christians: “I am eager to preach the gospel to you.” Thus, Christians need to hear the gospel even after conversion (“gospel” defined as: “the good news of salvation to hell-deserving sinners through the Person and work of Jesus Christ”). When my timid heart questions why God would want to love one so sinful as I, I read the answer, “to the praise of the glory of His grace.” I figure, then, that my unworthiness must actually be useful to God, because it magnifies the degree to which His grace might be glorified as He lavishes His saving kindness upon me (54). Each reason is about two paragraphs long and contains some valuable blessings which the gospel can render in life like: sufficiency for all I need, freedom from sin’s power, liberation from self-love, and a heart for the poor (e.g. the needy may be that way because of sin or ingratitude, but haven’t we been spiteful to God when seeking His help?). Part two and three are Gospel narratives, prose and poetic versions respectively. 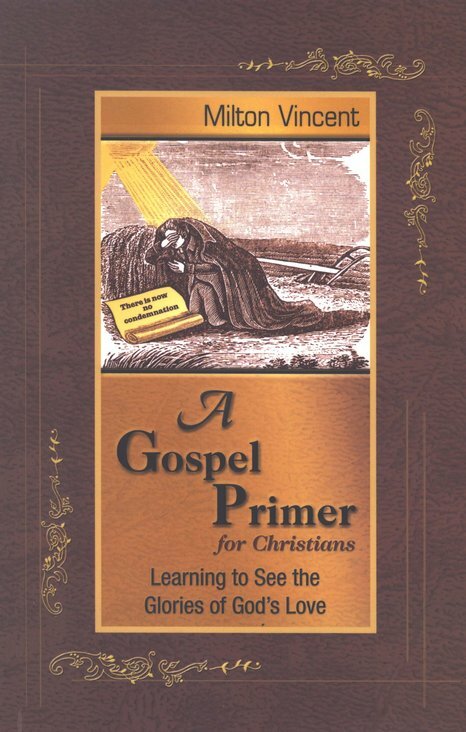 The final part is entitled “Surprised By the Gospel”, which is the story behind this primer. This is an excellent guide to help Christians embrace the gospel more fully. It could be used to introduce the gospel to someone for the first time, or deepen a believers resolve to embrace the gospel more holistically. Don’t expect this book to be profound in its insight; its greatest strength is the concept: rehearse the gospel in every situation. Still, the book contained one idea that gave me pause. Vincent seems to make no distinction between the removal of God’s positional and temporal wrath upon sinners. Of course, we know that God’s wrath upon sinners was appeased legally at the cross (Rom. 3:25), but does this mean that God is no longer angry or wrathful toward his children when they sin? Vincent seems to think so. He writes: “As a justified one, I am under God’s gracious favor at all times because of what Jesus did! This favored standing with God has nothing to do with my performance, but only with the performance of Jesus!” (pg. 94, emphasis mine). Now I realize that 100% of the wrath I deserve for my sins was truly spent on Jesus, and there is none of God’s anger left over for me to bear, even when I fail God as a Christian. Hence, God now has only love, compassion, and deepest affection for me, and this love is without any admixture of wrath whatsoever. God always looks upon me and treats me with gracious favor, always seeking to work all things together for my ultimate and eternal good. All of these realities hold true even when I sin. My question is: at the moment I lust after more money or tell a falsehood, does God’s love for me have an “admixture of wrath”? Does God only have deepest affection for me when I sin? Don’t government officials carry out “God’s wrath” on wrongdoers, including Christians (Rom. 13:4)? Christians can grieve the Spirit (Eph. 4:30) and ought to renew their minds daily in order to discern what is pleasing (and not pleasing) to God (Rom. 12:2). Even the BCF of 1689 says that sinning believers “incur God’s displeasure” (17.3). If the author would agree with this, he could have been clearer by distinguishing the facets of God’s wrath. The danger is that Christians may be comforted superficially to think that God is always happy with us—even when we sin. Milton Vincent has given us a gift that encourages us to embrace and rehearse the Gospel in every sphere of life. Further, with so many Scriptural texts, it could be used as an excellent tool for new Christians to understand a fuller meaning of the Gospel. Hebrews 12 and other chastening passages also come to mind. God disciplines His child and causes pain as a response to the believer’s sinful actions. Why wouldn’t we describe these actions of God as having some “admixture of wrath”?